This six-pack is calorie-free and goes down easy. Whistler Blackcomb‘s new Harmony 6 high-speed chairlift – open tomorrow – will be capable of transporting six on each chair and will boost uphill capacity from 2,400 skiers per hour to 3,600. The Doppelmayr high-speed Harmony 6 will keep the same alignment as the previous lift and will service the Harmony Zone, opening up over 485 hectares (1,200 acres) of terrain – from the edge of the Symphony Amphitheatre all the way over to Glacier Bowl. Hello, undulating cruisers and mystical glades galore. Saturday is also Dress Like Santa Day. 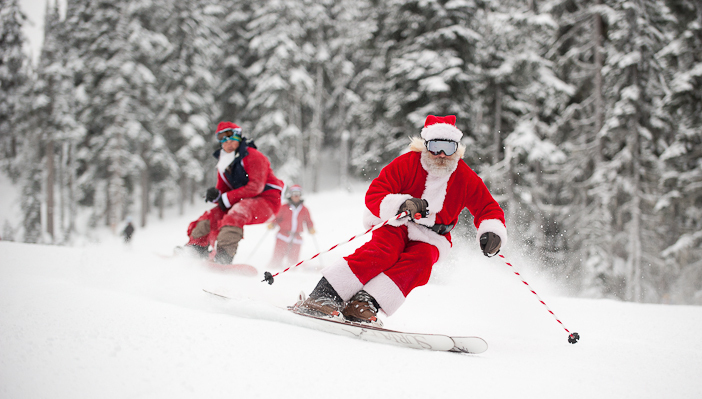 A free lift ticket goes to the first 75 people to arrive at the Garibaldi Lift Company, at the base of Whistler Mountain, in full Santa or Mrs. Claus garb. The costume must include red or black pants or a skirt for Mrs. Claus, a red jacket with white trim, a black belt, a beard for Santa and of course, a Santa or Mrs. Claus hat.